Since we left Cape Town, we have been feeling very isolated. Our ship was not seen land or any hint of civilisation for over a week. We are a small speck of people in a metal can on what I am realizing to be a very big sea. There’s no radio signals here, no distant aircraft or contrails, no ships, nothing – just us, the sea, the ice and the occasional animal. The radars show only icebergs and sea backscatter. I think the last two blog posts convey how remote we feel from anything. So, imagine my surprise yesterday when I was ambling along the midship, minding my own business, when a helicopter flew overhead. A chap on it opened a door and waved at me. I waved back, a little perplexed, and then it flew off. Helicopters are fun any day, but are particularly so when there’s no obvious place for it to have come from, and when it is basically impossible that it could have stumbled upon us by chance. Helicopters can’t fly far. I rushed up tot the bridge – my favourite place to be when something fun is happening, it seems – and the officers up there seemed equally astonished. They were trying to radio it with no success. 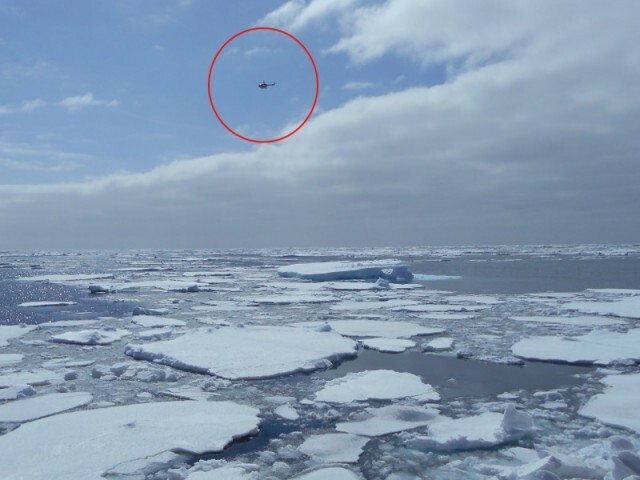 We later found that the helicopter was based on a German ship, the Polar Stern, which was some hundred miles away. Seems they flew out to wave to us. They have since sent us an electronic Christmas card. Nice to know we are not as alone here as it first appears. In other news, the ice we are breaking through now is a lot thicker and covers more of the surface. It looks a bit like what the area around Halley will look like! A few times we’ve gotten “stopped” by the ice and have needed to reverse to try another way.